Thank you for serving as the Program Coordinator for your TeamMates chapter. We appreciate all you do to support and encourage our mentors and mentees! Please find information and links below to assist you. For questions, please contact your Regional Coordinator or the staff member overseeing the area in which you have questions. TeamMates Sites and Resources: Use the links below to access the resources and information you need to run your TeamMates chapter successfully. 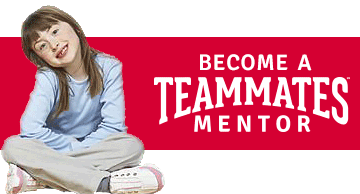 TeamMates Social Media: Connect with us on social media for TeamMates news, event information, and for activity ideas and resources you can share with your mentors and mentees. Other Mentoring Resources: Keep up to date on the latest information, research, and resources in the world of mentoring!